The main problem here is that effect is mistaken as the cause. Creativity may lead to a certain amount of imbalance. But the imbalance is not the source of creativity. There are two reasons why creativity may lead to disturbance or imbalance in the personality. In a deeper perspective, creativity is the result of a higher force of Nature beyond the ordinary mind working in the human consciousness. So a creative person feels a much greater creative pressure on her mind, heart or brain than the non-creatives. This may lead to a certain amount of imbalance in the personality. If some part of the mind, heart or brain is unable to bear the creative pressure, it can get damaged. While those parts of the brain or consciousness which are strong enough and receptive can receive and assimilate and express the creative force, the other parts which are unable to bear the creative force may get ruptured. The second factor is that if a professional activity requires the exercise of a single part or faculty of the brain or mind and the individual spends most of his time and life in that particular faculty then the other pars and faculties may get weakened. For example, Charles Darwin, in a poignant passage in his autobiography, bemoans that he has become a scientific machine ferreting out facts and as a result lost the aesthetic and emotional sensitivity of his earlier years. However such imbalances are not something unavoidable. They can be corrected through a systematic education and discipline based on the practices of Indian yoga like for example building inner peace, widening of the consciousness and a conscious attempt towards a balanced development of the faculties of the body, mind, heart and soul. For example unlike Darwin, Einstein kept his passionate interest in music along with his scientific pursuits. So to be creative and “well-rounded” are not mutually exclusive things. 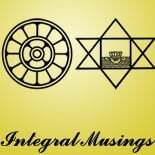 It is perhaps possible to be both through a path of integral education. This entry was posted on October 24, 2014 by integralmusings in Society & Culture.